AFC Fylde have secured the services of goal-machine striker Danny Rowe for a further two seasons after turning down a bid from League One club Oldham Athletic. Last season’s 50-goal striker has signed a new two-year contract with the option of a further year. The 28-year-old, who has scored at least 31 goals in each of his three seasons with the club, needs just three more to break Richie Allen’s all-time club record of 119. The offer from the Latics was thought to be £50,000, half of it up front and the rest to be paid in the event of Oldham gaining promotion. AFC Fylde apparently rejected the offer out of hand for the National North player of the year, who also dominated the club’s end-of-season awards. 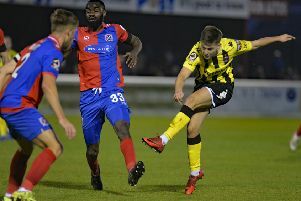 The FA are refusing to comment about the ongoing investigation into allegations that seven AFC Fylde players breached regulations on betting on matches. But betting by players and officials on any football matches is strictly forbidden, even though there is no suggestion that the seven un-named players under scrutiny bet on Coasters’ matches. What is clear is that the FA will have been alerted to the allegations by bookmakers. The FA work together with the Gambling Commission and betting companies who all monitor and detect breaches of the betting rules. There is always a clear paper trail to follow and the FA has the power - and uses it - to interview players, requiring them to produce records such as itemised phone bills, betting account statements and bank statements. As the FA have stated in their rule-book: “Match-fixing, or breaching the FA betting rules, or using inside information, is serious stuff. “If you attempt to match fix, or breach the FA betting rules, or pass on inside information, you are likely to get caught and receive a FA charge. If found guilty, then this can lead to financial penalties, suspensions, and in some instances, lifetime bans. The news of the FA probe has come as a bombshell to Fylde and put a dampener on their preparations for playing in the top tier of English non-league football for the first time in the 2017-18 season. The fixtures for the new campaign are out tomorrow.